Dale Chihuly blown glass sculpture at Denver Botanic Gardens, 2014. Lately I’ve been craving a little magic. Just a little lifting from the tedium of monitoring my children’s homework, some temporary relief from the shock of global violence. Today’s adventure soothed my soul. Entering the Denver Botanic Gardens, vivid cobalt tendrils strike the sky, like a sentinel gesturing over a new and wild land. This sculpture, hand-blown by internationally acclaimed glass artist Dale Chihuly, extends a dramatic welcome. As I turn and meander down a bush-lined corridor, I feel like I am stepping into a fairytale; and any sort of creature at all might creep around the next bush. Amidst the brilliance of late summer blooms, speckled bulbs swell, lacy edges sashay, spiky spears glisten. The interplay of color, texture, and form transports me as I wander, feeling with each strange shape I pass as if I might be approaching the throne of a mighty magic queen. And peeking past a fountain, it is almost as if she appears. Wisps of orange rise stately and tall, tended by curved and spiky courtiers gathered round. With every turn of the garden paths, sculptures come into view like glass poems, merging and emerging from their natural environment. Near the Monet ponds, a boat constructed of rustic wood cradles a pile of multi-colored balls, spun like sparkling magic. 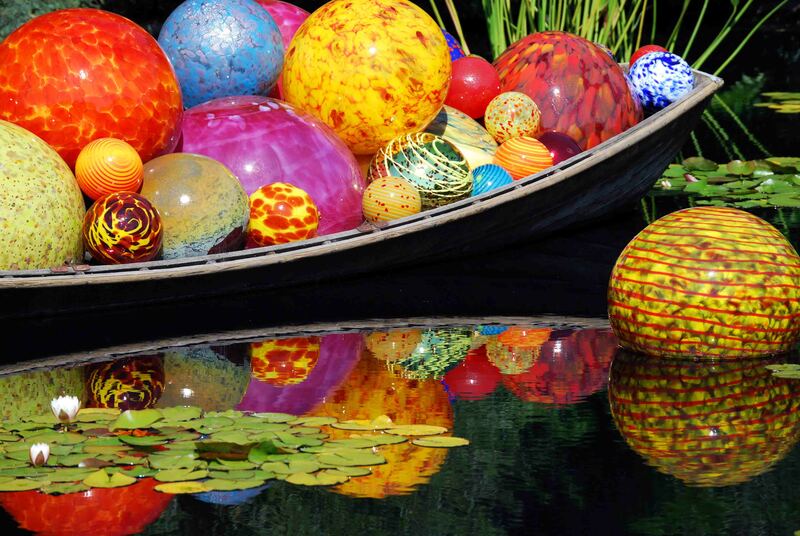 Spheres scattered in the water echo colors of surrounding lily pads. I feel that if only I could step into that boat, I would discover the portal to my dreams yawning open at last. And perhaps in Chihuly’s magical vision, my heart actually discovered a secret gate. I carry the inspiration of today into tomorrow; and who knows where the gift will lead? PS The most wonderful part of the day was sharing it with my beautiful mom. Thank you for visiting! I am a great admirer of your work! The interplay of botanical shapes with fanciful art was just stunning! Thanks so much for visiting. What gorgeous colours! I feel a bit inspired to add a bit of brightness to my home…has it given you inspiration for a new painting? I was working on a big, plant-inspired watercolor when I visited, and definitely Chihuly’s inspiration of color and shape is making its way into the continuation of the painting! Thanks for visiting Teresa! Thank you! It was an amazing exhibit! Chihuly is an amazing artist, isn’t he! And you have captured his magic in these lovely photographs. I wish you a great and inspiring weekend. I am glad I could reveal even just a tiny bit of the magic I experienced. I expected to enjoy the exhibit; I didn’t expect to be transported! It was amazing. Thank you Otto. I’ve only seen it on film. Our local fine arts center in Colorado Springs has a lovely collection of works by Chihuly, and a film constantly playing that shows him at work. It’s amazing! I would love to see it in person.